From the graceful movements of the Poi to the overwhelming power of the Haka, Kapa Haka (traditional Maori performing arts) is intrinsic to New Zealand’s cultural identity. Distinctive from other indigenous performing arts, Kapa Haka combines song, dance, expression and movement. 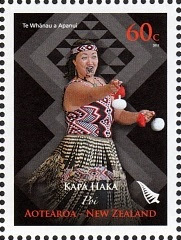 The term Kapa haka (kapa meaning 'rank' or 'row' and haka refers to a Maori dance) is commonly known in Aotearoa as 'Maori Performing Arts' or the 'cultural dance' of Maori people. 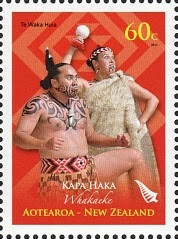 Kapa haka is an avenue for Maori people to express their heritage and cultural identity through song and dance. 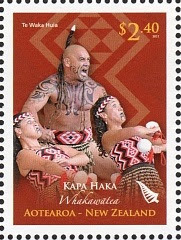 It can be said that Kapa haka dates back to pre-European times where it developed from all traditional forms of Maori pastimes; haka, mau rakau (Maori weaponry), poi (tiny ball attached to rope or string) and moteatea (traditional Maori songs). The significance of these everyday activities were influential to the development of kapa haka. A kapa haka performance involves choral singing, dance and movements associated with the hand-to-hand combat practised by Maori in precolonial times, presented in a synchronisation of action, timing, posture, footwork and sound. The genre evolved out of a combination of European and Maori musical principles. Every two years, kapa haka from all parts of New Zealand compete in Te Matatini, New Zealand's national Maori performing arts competition for adult groups. 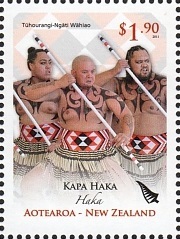 This stamp issue features the winners of the 2009 competition. Te Iti Kahurangi of the Tainui region. Te Whanau a Apanui from the Mataatua region. Whakaeke is a choreographed entrance onto the performance area, where elements of all disciplines are utilised. Whakaeke are also choral pieces. They are frequently used to comment on a social issue of the day or to commemorate an individual or some element of Māoridom. They may also simply be used as the entrance song to announce the group's arrival. Te Waka Huia of the Tamaki Makaurau region were the winners of Whakaeke in 2009 and placed first in the overall competition. Poi is a graceful aspect of the Kapa Haka performance, where the dancer (usually female) swings a raupo ball, about the size of a tennis ball, attached to the end of a flax cord. Poi's origins lie in the precolonial practice of training with poi to improve agility in battle, but today poi is used to showcase the beauty and gracefulness of the women. Poi were also traditionally used by women on long Waka voyages as a means of keeping the timing of the male paddlers, in the style of a coxswain. This is the reason for the emphasis of the sound of the poi striking the hand. Performers swing the balls in synchrony in a variety of figures and rhythms while simultaneously singing a song (a waiata poi) accompanied by guitar. They demonstrate great dexterity and coordination, particularly with "long poi", with cords up to a metre long, where four poi at once may be manipulated by each performer. Formerly the balls were made of raupo and the cords of flax but today they tend to be made of plastic shopping-bag material and yarn. The sound of poi striking the hands is an important part of the musical accompaniment and use of modern materials makes for a better sound. In 2009, Te Whanau a Apanui from the Mataatua region were the winners of this discipline and placed third overall in the competition. Te Iti Kahurangi of the Tainui region. Tuhourangi-Ngati Wahiao of the Te Arawa region. Waiata-a-ringa are action songs, where the hands, face, eyes and body combine to bring a form to the words. Waiata-ā-ringa (literally "song of hands or arms") are "action songs", which means that they display the typical Polynesian practice of embellishing and reinforcing the sung poetry with arm and hand actions. They are performed by both men and women, with women in the front and men in the back. Some use melodies from common English-language songs with new lyrics in Māori, while others are newly composed, treating a wide variety of topics. They feature the wiri or trembling of the hands to indicate the interface between the mind and the body. The 2009 winners of Waiata-a-ringa were Te Iti Kahurangi of the Tainui region. The Haka is the most widely known discipline, made famous worldwide by New Zealand’s sports teams such as our national rugby team The All Blacks. It’s an aspect of Maori culture embraced by all New Zealanders. Haka are best described as challenges. They are used to make a point and to vent anger. They are performed by both men and women, with the focus on the men in the front and support from the women behind. They are vocal performances involving rhythmic declamation in triple metre and aggressive or challenging facial expressions (pūkana, literally "glaring"), body movements and demeanour. The men make heavy use of foot stamping, body percussion, and grimace in an attempt to appear as menacing as possible. Haka are often described as traditional war dances but in fact had many other uses as well in precolonial Māori society, and have many peaceful uses today. 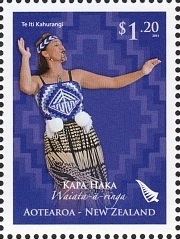 In 2009, Tuhourangi-Ngati Wahiao of the Te Arawa region were the winners of the Haka performance. Te Waka Huia from the Tamaki Makaurau region. Whangara mai Tawhiti from the Tairawhiti region. Whakawatea is a choreographed exit off the performance area, where once again elements of all disciplines are utilised. Choral pieces used to farewell the audience or make a final point before departing the stage. They may pick up on themes raised in the whakaeke or comment on the event at hand. Performers are often at the side or back of the stage. Te Waka Huia from the Tamaki Makaurau region were also the winners of this discipline in 2009 and placed first overall. The discipline of Moteatea is a traditional chant, however, contemporary compositions are becoming more common. Moteatea are unison songs performed in a style reminiscent of precolonial Māori singing. They are an important genre within Maoridom because they tell stories in which historical, genealogical and cultural information is preserved and thus link Māori with their past. Mōteatea come in a variety of forms including laments, lullabies, and songs about revenge, anger, and love. 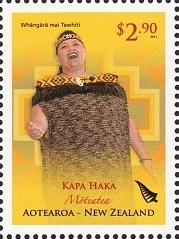 In recognition of Whangara mai Tawhiti (from the Tairawhiti region) placing second overall in Te Matatini 2009, they feature on the Moteatea stamp. To my shame I have neglected to follow this blog or continue exploring as I said I would. There is a lot I want to read here. Now Kapa Haka is a passion of mine. I take part in training a team as well as performing too. You gave us a detailed overview here. Well done. 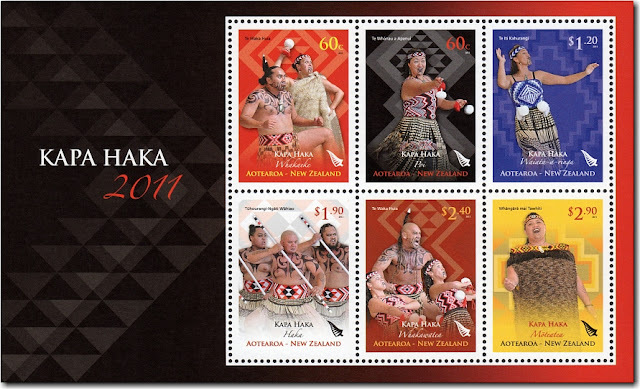 I've not taken much notice of Kapa Haka until I came to do this post. I didn't realise there was such a range of songs involved in one performance. What did surprise me was that there are opening and closing songs too. Yes, I learnt more about Maori culture doing this one. I was interested in seeing you are involved with a Kapa Haka group too. Would like to talk with you more about that. If you wish, please send me another comment with your contact details. Mark your comment "Non Publish"
Allan, since you've been doing these posts on Maori subjects I think we have all learnt a lot.